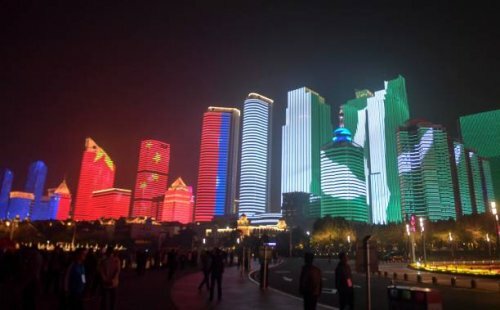 At a time when China’s Belt and Road ambitions are facing a major project cancellation in Malaysia, pushback on M&A from the EU and questions about the buildup of debt in Sri Lanka and across Africa, the 18th Shanghai Cooperation Organization (SCO) Summit provided an opportunity for China to re-affirm its strong relationship with the core countries along the land route to Europe. China, Russia, Kazakhstan, Kyrgyzstan, Tajikistan and Uzbekistan established the SCO (covers both security and economic issues) in 2001. Pakistan (a key Belt and Road Initiative, BRI, participant) and India (had been keeping its distance) both joined in 2017, and President Mamnoon Hussain and Prime Minister Narendra Modi both attended the summit in Qingdao, Shandong. Iran has observer status and wants full membership; President Hassan Rouhani attended the meeting. Other leaders, including President Vladimir Putin of Russia, made state visits to Beijing ahead of attending the summit. During his visit to Beijing, Kazakh President Nursultan Nazarbayev stated the intention of Kazakhstan to further integrate into the BRI. Kazakhstan is China’s biggest trading partner in central Asia, and Chinese investment has been particularly strong in the oil rich Mangistau province. Kazakhstan has its own domestic "Bright Path" initiative, proposed by President Nazarbayev in 2014, to spur economic growth through investment. To coincide with his visit, the Silk Road Fund signed a memorandum of understanding on strategic partnership with the Astana International Financial Centre, and a framework agreement with Astana International Exchange to subscribe to common shares through the China-Kazakhstan Production Capacity Cooperation Fund Co, a wholly owned subsidiary of the Silk Road Fund. The Silk Road Fund said that the cooperation is expected to help better align China’s BRI with Kazakhstan’s Bright Path economic policy, strengthen China-Kazakhstan ties, advance Kazakhstan’s financial reforms and the development of its capital market, and provide incentives for Kazakhstan’s social and economic progress. It will also allow the Silk Road Fund to leverage its financial expertise to boost the two countries’ cooperation in production capacity through financial partnerships. The subscription of common shares in Astana International Exchange by Silk Road Fund will be the first investment made by the China-Kazakhstan Production Capacity Cooperation Fund Co.
Astana International Financial Center is a financial free zone established in Astana, the capital city of Kazakhstan, following an order of President Nursultan Nazarbayev in June 2015, with the Astana International Exchange being one of the free zone’s core elements. The China-Kazakhstan Production Capacity Cooperation Fund Co (US$2 billion) is solely sponsored by the Silk Road Fund. It supports projects promoting cooperation in production capacity and investments in other relevant areas between China and Kazakhstan. Also visiting Beijing was Kyrgyz President Sooronbay Jeenbekov, making his first official trip to China since taking office in November 2017. He met with President Xi Jinping on 6 June 2018, to discuss bilateral ties, including political, trade, and economic cooperation. China and Kyrgyzstan agreed to establish a comprehensive strategic partnership. President Xi called on both sides to enhance synergy in development strategies and policy coordination, seek more converging interests and growth points, and jointly plan key areas and projects. Uzbek President Shavkat Mirziyoyev was also in Qingdao, and the Silk Road Fund signed a cooperation framework agreement with Uzbekneftegaz to support Uzbek oil and gas projects. The fund’s investment and financing can be denominated in both US dollars and RMB. The fund signed an MOU for cooperation with National Bank of the Republic of Uzbekistan for Foreign Economic Activity to invite Chinese companies to participate in the construction of a cultural tourism complex in Samarkand. The parties aim to help the city build cultural tourism attractions with Silk Road heritage. Uzbekneftegaz, Uzbekistan’s only operator of oil, gas and natural-gas condensate, engages in the exploration, extraction and production of oil and gas. National Bank of the Republic of Uzbekistan for Foreign Economic Activity is Uzbekistan’s largest commercial bank. It handles Uzbekistan’s import and export business, attracts foreign investment and provides international settlement and clearing services.